Update December 7, 2018 9:00AM ET: This article was originally published on November 19, 2018 and has been updated to include video. Two years ago, Microsoft released its first desktop computer, the stunning Surface Studio. 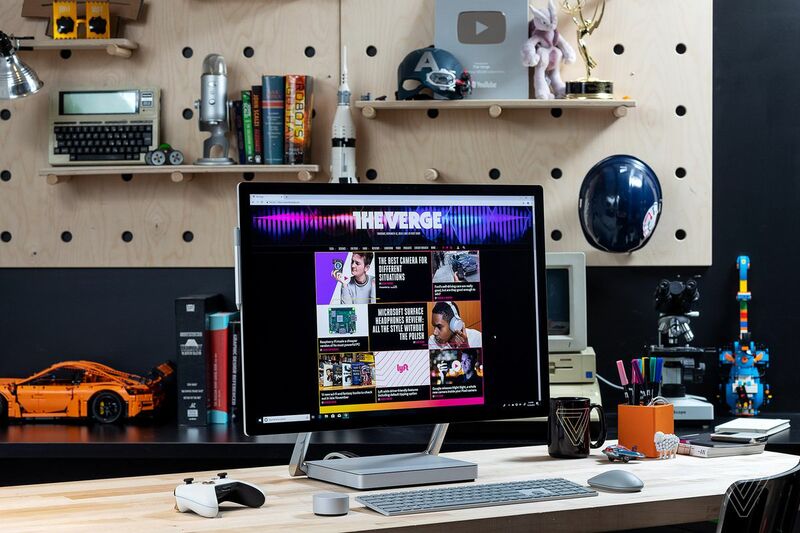 The Studio was an all-in-one PC with a massive, 28-inch touchscreen display that could pivot like an easel to lay almost flat for drawing and artwork. It’s no exaggeration to say that the Studio is one of the most head-turning PC designs ever released. But despite its gorgeous, futuristic design, the Studio was far from perfect. Even though it was a desktop computer, it was powered by laptop-class processors and graphics cards, which were already a generation behind at its release. Instead of a modern, speedy SSD, it used a hybrid drive that was slower and more prone to failure. On top of that, the Studio was downright expensive. You could reasonably expect to pay more for the Studio’s groundbreaking design and stunning display, but its internal hardware didn’t line up with its sticker price. 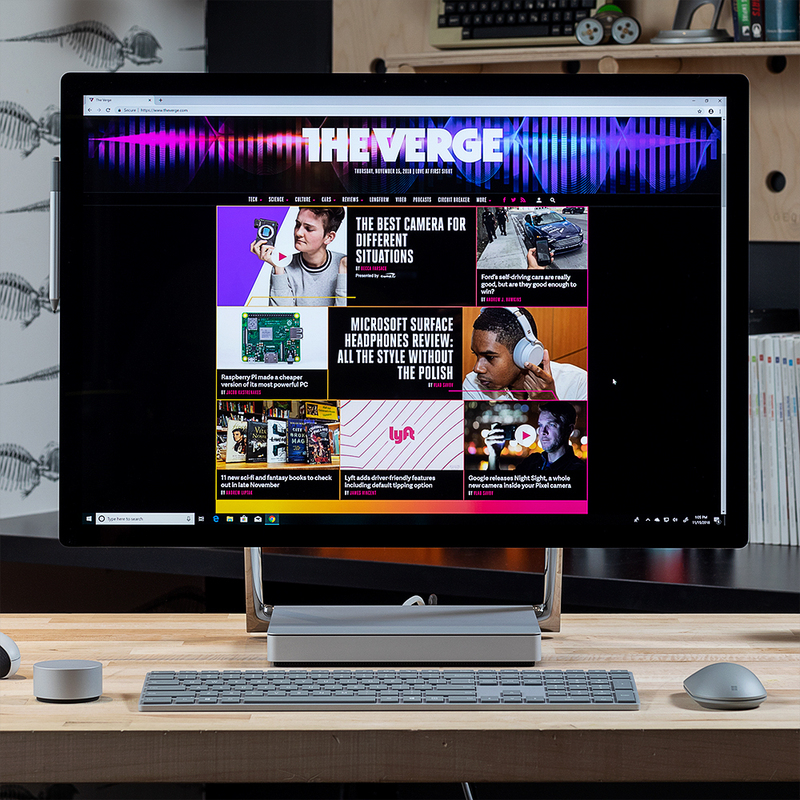 So, for the new, $3,499 and up, Surface Studio 2 Microsoft did the obvious things: it kept the design and features exactly the same, but it greatly improved the internal specifications. The Studio 2 has a more powerful processor, significantly better GPU options, and, perhaps most importantly, a proper SSD. It’s still expensive — in fact, it starts at $500 more than the prior model — and it still relies on laptop components, but this time, it feels like a more rational computer than just a pretty piece of desktop eye candy. And it’s still so pretty. The best part of the Surface Studio 2 is the same as it was before: the massive, bright, pixel-dense touchscreen that’s floating on a hinge. Most of the display’s specs are the same — 28 inches, 4500 x 3000 pixels at 192DPI, 3:2 aspect ratio — but this time around, Microsoft has significantly boosted the brightness, up to over 500 nits, and increased the contrast. It’s a stunning screen to behold, especially when you’re sitting just a few feet away from it. Even if you never take advantage of the fact that the screen pivots down almost flat, it’s still one of the most engulfing PC displays I’ve ever used. It’s a crying shame that Microsoft doesn’t sell it as a monitor-only option. 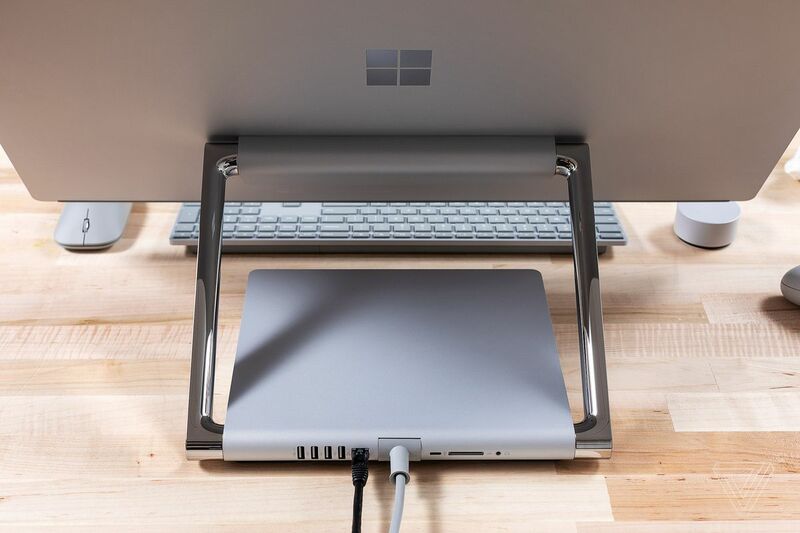 The base design of the Studio 2 is also the same as before, but Microsoft has added a USB Type-C port alongside the full-size SD card reader, gigabit Ethernet jack, and four USB 3.0 ports. Unfortunately, the USB-C port does not support Thunderbolt 3, so you can’t use an external GPU or high-speed storage devices with the Studio 2. All of the ports are also on the back of the base, which can make them hard to reach. It would have been nice if Microsoft moved the SD card reader and one USB port up front for easier access. Inside that base is a quad-core Core i7 processor, up to 32GB of RAM, up to a 2TB SSD, and either a Nvidia GTX1060 or GTX1070 mobile GPU. Wisely, Microsoft dropped the Core i5 / 8GB RAM base model option. (Even the entry-level Studio 2 has the Core i7 chip and 16GB of RAM.) Frustratingly, Microsoft is using a 7th Gen chip instead of the 8th Gen Core processors that have been showing up in devices all year and have significant multicore performance bumps over the older chips. For a premium device with a premium price tag, Microsoft should really be using the latest and greatest processors available. That isn’t to say performance is bad on the Studio 2. In fact, it’s quite the opposite: the $4,199 midlevel model I’ve been testing, which has 1TB of storage, 32GB of RAM, and the GTX1070 GPU, positively screams through most tasks, whether that’s daily productivity work, video or photo processing, graphics work, or even AAA games. The Studio 2 is exactly as snappy and responsive as you’d expect a multithousand-dollar workstation to be. Using the Studio 2 for productivity work is unlike any other desktop setup. I use a 34-inch ultrawide monitor when working from my desk because it provides over 400 square inches of screen real estate for me to throw windows around. The Studio’s taller aspect ratio means it gives me even more screen real estate: over 430 square inches. It’s a giant digital canvas for me to put windows wherever I want. Though it’s not targeted toward gamers and it’s not a dedicated gaming PC, playing games on the Studio 2 is a joy. Its native resolution is too high to make most AAA games playable, but the 1070 GPU can maintain 60 frames per second on visually intensive titles such as Forza Horizon 4 and Star Wars Battlefront II at 3000 x 2000 pixels. More demanding games, such as Shadow of the Tomb Raider require ratcheting down the resolution to 2250 x 1500 to maintain 60 fps. But even at the lower resolutions, the bright, colorful display that’s only a few feet from my face makes any game I tried look great. The unique 3:2 aspect ratio might cause some issues with games like Overwatch that require a 16:9 viewport (you’ll have to deal with a significant portion of the screen being blacked out with titles like that), but all of the games I tested scaled to the full screen with no problems. 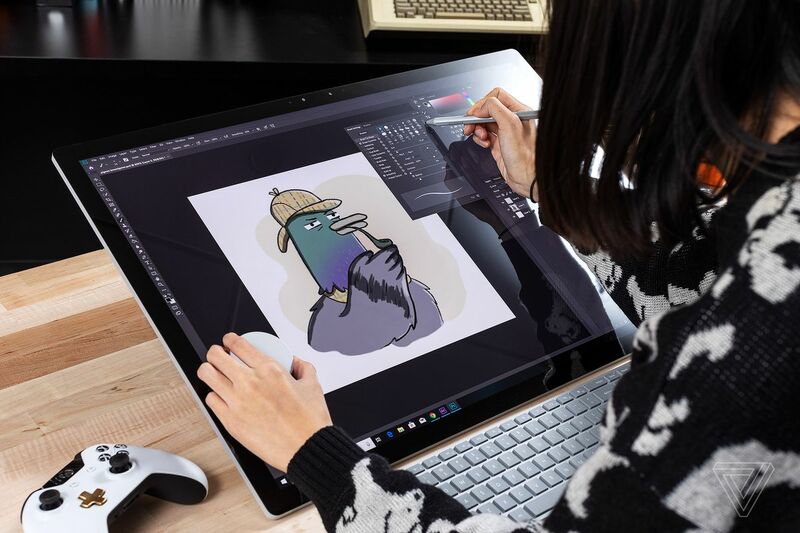 Of course, the Studio 2 isn’t really made for gamers or writers like me; it’s designed for creative professionals who might use a drawing tablet and pen input to create digital artwork. Unlike an iMac, the Studio doesn’t need a separate Wacom tablet and pen, because it has built-in support for Microsoft’s Surface Pen and is a giant tablet itself. When you want to draw on the screen, just pivot it down to its lowered, 20-degree position, and suddenly, the Studio is a giant 28-inch surface for digital art. The 3:2 display ratio really makes the screen feel huge. There’s more than enough space on the screen to look at reference images on another window while drawing, and I liked having a video tutorial open in another window while following along in After Effects. The included Surface Pen is thicker and more comfortable to hold than the Apple Pencil. It’s closer to a Wacom stylus with its replaceable nibs and re-mappable side button and end button, the latter of which also doubles as an eraser. It’s got 4,096 levels of pressure sensitivity, includes tilt support, and I didn’t experience any sort of lag or notice any offset between the cursor and stylus with it (a problem that sometimes affects the Wacom Cintiq lines). It also attaches magnetically to the side of the screen, which is nice, so you don’t lose it. One weird issue I ran into while drawing was discovering that the Surface Pen was still suffering from the jitter issue that’s plagued the Surface line for months. Microsoft said it had fixed the issue in August through a firmware update, so I’m not sure if the problem is back or if the jitter issue used to be worse. I tried drawing straight lines, both freehand and with a ruler, and the issue of wobbly lines persists if you draw slowly. It goes away if you draw with fast strokes, so the issue isn’t too big of a deal, but it still feels like a problem that a $3,500 creative device shouldn’t be having. There’s also a $99 Surface Dial accessory that isn’t included in the box, and it hasn’t been updated since the last Surface Studio. There are a couple of drawing apps that are optimized to give the Dial more features like Sketchable, but because I’m so used to keyboard shortcuts, I can’t really see myself adopting the Dial for everyday use. On a screen that already has touch support so you can do things like pinch to zoom, having a dial feels almost redundant. Despite the improvements Microsoft has made, there are still plenty of areas where the Studio 2 could be an even more compelling machine. I can’t plug in an external GPU to give it even more graphical oomph because it doesn’t have Thunderbolt 3. I can’t use the Studio 2’s gorgeous display as a monitor for a more powerful workstation because it doesn’t support video input. And this might sound like a nitpick, but with a $3,500 and up computer, no nit is too small to pick: Microsoft packages the worst mouse with the Studio, a cheap-feeling, two-button scrollwheel wireless deal. 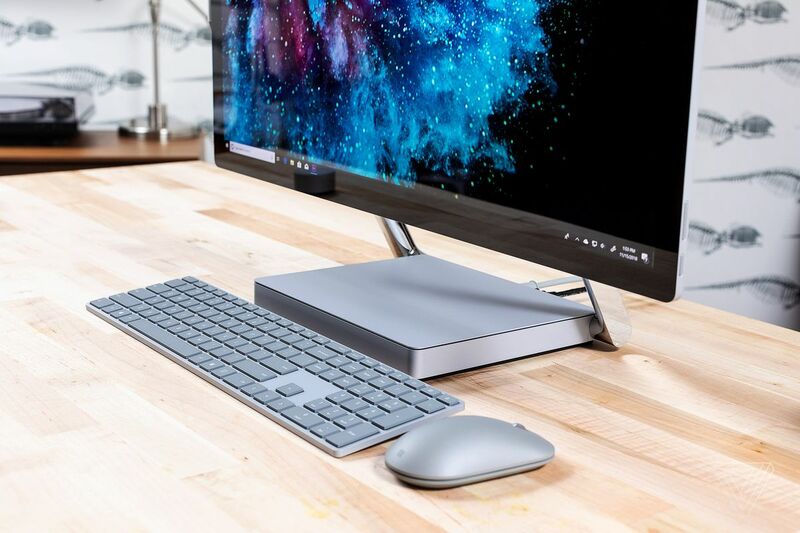 Microsoft has much better mice in its hardware portfolio, so it’d be nice if it included one of those with its high-end flagship desktop PC. Fortunately, the wireless keyboard is very good, and Microsoft does include the Surface Pen, which it stopped doing with portable Surface computers. 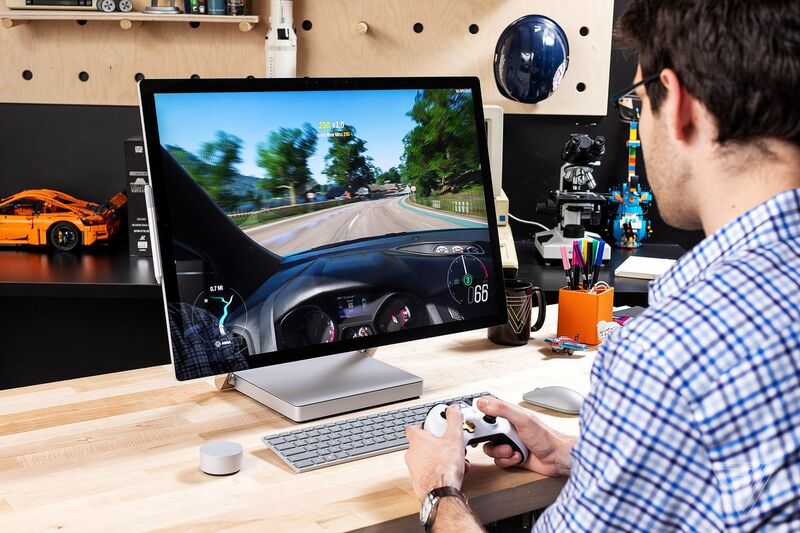 But overall, it’s really hard to not instantly want a Surface Studio 2 from the first time you sit down in front of it. It’s a visually stunning, highly capable desktop computer with a versatility you won’t find anywhere else. I can use it to write, browse the web, or play games, and if I could actually draw worth a damn, I could use it to create artwork, as well. The Studio 2 is just more fun to use than the standard all-in-one or desktop and monitor setup. It certainly is designed for a niche market where cost isn’t as big of a concern as what the device can do, but if that’s you, it’s hard to find a better option.